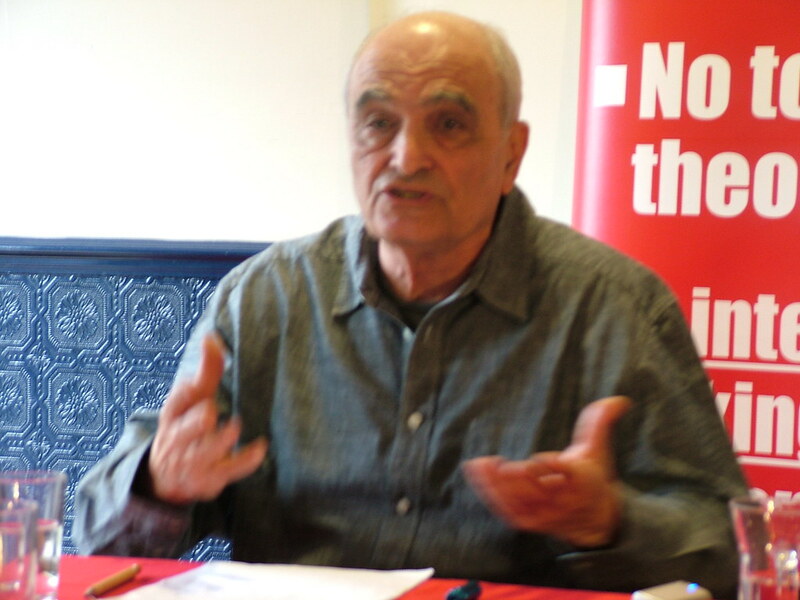 Moshé Machover speaks at the CPGB (Mark 2) Communist University of London, 2012. Moshé Machover, 81-year old member of Hampstead & Kilburn Labour Party and a pre-eminent theorist, historian and activist in the Israeli Socialist organisation Matzpen over many decades, has been summarily thrown out of the Labour Party. We reprint here a letter from the Labour Party, signed by Sam Matthews, Head of Disputes, expelling Moshé without due process – accused, charged, prosecuted, judged and sentenced in one letter and without even the apparent need for a hearing. A full JVL statement will be issued later today. The whole campaign of equating opposition to Zionism with antisemitism has, in fact, been carefully orchestrated with the help of the Israeli government and the far right in the United States. It is easy to explain why. Over recent years there has been a shift in public opinion regarding Israeli policy and the conflict in the Middle East and the legitimation or otherwise of Israel as a Zionist, colonising state. One factor behind this shift has been the campaign for boycott, divestment and sanctions. When the BDS campaign was very young there was some discussion about whether it could actually overthrow the Zionist regime – just as some people thought a boycott of South Africa could overthrow apartheid. Of course, all analogies between South Africa and Israel are misleading, because they represent two different models of colonisation. But, leaving that aside, while sanctions may help to produce favourable conditions, those who think they are going to overthrow the regime in this way are deluding themselves. The BDS campaign has, however, been a mobiliser of public opinion. Its advantage is that in various trade unions and professional organisations, in every college and university, there is a group of people campaigning, and this has provoked a very useful debate about the Israeli-Palestinian conflict. What is remarkable is that among the BDS activists there is an overrepresentation of young Jewish people. That is very worrying for the Zionists and if you read the Israeli press it is clear that there is a determination to halt this erosion of support for the Zionist state by discrediting its critics. This was the situation before there was even a hint that Jeremy Corbyn could become Labour leader. Of course, his election has added to worries, because for the first time ever a leader of the main opposition party in Britain is someone who has a long record of supporting the Palestinian struggle. And so the Zionists and all their allies decided to launch their ‘Anti-Zionism equals anti-Semitism’ campaign. Accidentally or not, the current Israeli ambassador to London is a certain Mark Regev, who has consistently justified Israel’s crimes. Regev is hardly a normal diplomat – he is a propagandist by trade. And, of course, the ‘Anti-Zionism equals anti-Semitism’ campaign has been taken up by those who have no particular pro-Israel sentiments, but are looking for ways to attack the left of the Labour Party. So there is now a coalition between, on the one side, people worried about the rise in support for the Palestinian cause and who would like to discredit the Labour left for that reason; and, on the other, people like the vile blogger, Guido Fawkes, whose real name is Paul Staines – a rightwinger who would do anything to discredit the Labour left. He is using ‘antisemitism’ smears for opportunistic reasons, not because he really cares one way or the other about Israel/Palestine. The campaign has been remarkably successful and, of course, the biggest scalp so far is that of former London mayor and former NEC member, Ken Livingstone. What did he say that got him suspended? Hitler came to power in 1932 and “supported Zionism until he went mad”. Of course, he got the date wrong, Hitler came to power in 1933. It was also wrong to personalise the shift in policy. But the point he was making about the Nazi regime and Zionism is basically correct, as I shall demonstrate. How should the left react under such circumstances? A good friend of mine, who is on the left and has been a co-signatory of some of the statements we have been issuing, said to me that maybe we should not talk too much about Zionism, because people do not understand it and can get confused. Maybe we should just concentrate on the actual evils carried out by Israel. You will not be surprised to learn that this person belongs to that part of the left which is happy to talk about austerity, but does not want to mention capitalism. Everyone understands austerity and it is good to organise demonstrations against it, but ‘capitalism’ is too much of a political word. I fail to see how dropping mention of Zionism can work. Even the Zionists acknowledge that it is acceptable to criticise Israeli policy and would not be too concerned if we criticised, say, Israel’s continuing colonisation – building settlements on the West Bank and so on. But I ask a question: why does Israel persist in this? It is a policy which earns it the most criticism in the United States. Barack Obama and Bernie Sanders have criticised it directly and the British government’s official policy is that these settlements are ‘illegal’ – they are an ‘obstacle to peace’, etc. So why does Israel do it? How can you explain it? It can be explained by the fact that it is an essential part of Zionist policy. In carrying out this policy Israel is, if you like, following an imperative of Zionism from the very beginning. Once you accept that this is an integral part of Zionism, then you realise it would be strange if Israel did not attempt to implement it. It is not as if it were a policy specific to the current government of Binyamin Netanyahu. It has been carried out by all Israeli governments since 1967 and it took place within the former borders – the so-called ‘green line’ – before 1967. It has been an ongoing policy of Zionist colonisation from the very beginning. You cannot explain why Israel is continuing with a policy that is not winning it any friends without mentioning Zionism. On the contrary, I think what we should do is not apologise; instead we should go onto the offensive and be aggressive: directly attack Zionism. And you can also attack Zionism precisely because of its collusion and collaboration with antisemitism, including up to a point with Nazi Germany. We should not respond to the attacks by saying, ‘We are against antisemitism, as we are against all racism’, which is to accept that antisemitism is actually a problem on the left. While, of course, we oppose such racism, the fact is that its proponents within the left and the Labour Party account for a minuscule proportion. We can deal with anti-Semitism if it shows its head, but we should not make gestures as a kind of apology in the face of the current assault. The handful of people on the left who propagate a version of the ‘Protocols of the Elders of Zion’ carry no weight and are without any intellectual foundation. The Protocols contained claims of both capitalist and working class conspiracy: Jews were ‘overrepresented’ among capitalists, but they were also ‘overrepresented’ in the revolutionary movement. The antisemitic slogan in revolutionary Russia was: “Sugar – Brodsky, tea – Vissotsky, Russia – Trotsky” – the first two were magnates and all three were Jews. We can deal with similar nonsense on the left in our own time, but not as an apology in response to attacks on the left. On the contrary, we need to go on the counteroffensive. This change occurred following the attack on the Soviet Union, when the Nazis felt they had to find different ways of dealing with the ‘Jewish problem’. Until that time the official policy was for the exclusion of the Jews from political and civic life, for separation and for emigration. Quite naturally the Zionist leadership thought this set of policies was similar to those of other antisemitic regimes – which it was – and the Zionist approach was not peculiar to the Nazi regime. The founder of political Zionism, Theodor Herzl, had pointed out that antisemitic regimes would be allies, because they wanted to get rid of the Jews, while the Zionists wanted to rid them of the Jews. That was the common interest. Of course, looking back at all this, it seems all the more sinister, since we know that the story ended with the gas chambers a few years later. This overlap is an indictment of Zionism, but the actual collaboration between the two was not such an exceptional thing, when you accept that the Zionists were faced with the reality of an antisemitic regime. Let me repeat: we must go on the counterattack against the current slurs. It is correct to expose Zionism as a movement based on both colonisation and collusion with antisemitism. Don’t apologise for saying this. If you throw the sharks bloodied meat, they will only come back for more. At the moment the left is apologising too much, in the hope that the right will let up. They never will. On 27th September 2017 the Guardian published an article by Jonathan Freedland called Labour’s denial of antisemitism in its ranks leaves the party in a dark place. Ken Loach wrote a response for Comment is Free beginning “The taint of antisemitism is toxic. Yet, with hints and innuendos, your columnist, Jonathan Freedland, tries to link me, Len McCluskey and Ken Livingstone to Labour’s ‘dark place’, for which it seems we are in part responsible. This is cynical journalism. The Guardian has refused to carry Loach’s article. We are pleased to do so here. Addition: Today, 6th October, the Guardian has published a(n edited) letter from Ken Loach, under the heading Ken Loach: I give no legitimacy to Holocaust denial. The taint of antisemitism is toxic. Yet, with hints and innuendos, your columnist, Jonathan Freedland, tries to link me, Len McCluskey and Ken Livingstone to Labour’s ‘dark place’, for which it seems we are in part responsible. This is cynical journalism. What is his evidence? Len and I were welcomed at the packed first meeting of ‘Jewish Voice for Labour’. Strangely, Freedland ignored this progressive new group, which has published its own response to his attacks on us. The founding document says: ‘we stand for rights and justice for Jewish people everywhere and against wrongs and injustices to Palestinians and other oppressed people anywhere’. We support that. But Freedland disputes our right to contribute. We are ‘not Jewish – a fact that might limit their authority to speak on the matter’. The matter in question is antisemitism in the Labour Party. Many Jewish comrades say that they know the Labour Party to be a welcoming environment and have not experienced hostility as Jews. This chimes with my fifty years of involvement with the labour movement. But, for Freedland, this is a discussion to which only one group – Jews who share his political perspective – can contribute. It is exclusive – no place for solidarity or collective support. This goes against all traditions of the left where we stand alongside each other to oppose injustice. People join left organisations to fight racism and fascism, intolerance and colonial oppression. Throughout history, it is the left that has led this fight. Racism including antisemitism is real enough and will emerge in all political parties. The Jewish Socialists’ Group (JSG) acknowledges this in relation to allegations about the Labour Party: ‘a very small number of cases seem to be real instances of antisemitism’. I trust their judgement. This present campaign about antisemitism surfaced when Jeremy Corbyn became leader and drew on a number of cases that pre-dated his leadership. It has been led by his political opponents inside and outside the Labour Party, seeming in part to be aimed at undermining Jeremy Corbyn’s supporters and therefore his leadership. JSG wrote ‘accusations of antisemitism are being weaponised to attack the Jeremy Corbyn-led Labour Party’. Corbyn has always opposed racism and defended human rights wherever they have been attacked, which includes the plight of the Palestinians. This will alarm apologists for Israeli occupation and expansion. Further, he stands on a socialist programme which has disturbed the right of the party. There is a further, more serious allegation, that I gave ‘spurious legitimacy’ to Holocaust denial. In a BBC interview I was asked about a speech I had not heard and of which I knew nothing. My reply has been twisted to suggest that I think it is acceptable to question the reality of the Holocaust. I do not. The Holocaust is as real a historical event as the World War itself and not to be challenged. In Primo Levi’s words: ‘Those who deny Auschwitz would be ready to remake it.’ The first terrible pictures I saw as a nine-year old are ingrained on my memory as they are for all my generation. Like readers of this paper, I know the history of Holocaust denial, its place in far right politics and the role of people like David Irving. To imply that I would have anything in common with them is contemptible. The consequences of such a smear are obvious to all: let the poison escape and it will be picked up on social media and reputations may be tarnished for ever. A brief phone call would have clarified my position. One thing Freedland has got right – the ages of Len McCluskey, Ken Livingstone and me (he wittily makes a rhyme of our names). Freedland is happy to embrace one prejudice – ageism. that land stolen from the Palestinians should be returned to them and all illegal settlements removed, as UN Resolutions demand. that Israel is breaking the Fourth Geneva Convention by transporting Palestinian children to Israeli prisons without access to lawyers or their families. and that the deliberate destruction of civilian life, hospitals and medical facilities in Gaza during Operation Protective Edge were war crimes. And will he endorse the distinguished Israeli historian Ilan Pappé when he writes about the founding of Israel: ‘The ethnic cleansing of Palestine (is) a crime against humanity that Israel has wanted to deny and cause the world to forget’? So many questions, so many injustices. Labour has much to do in developing an ethical foreign policy and social and economic justice at home. It now has principled leaders and a growing, enthusiastic membership. Let the party not throw away this great opportunity. We have a world to win. As we will show, these activists’ concerns are much less about antisemitism than about Corbyn and the trend he represents. Pro-Israel groups, who have strong backing among the party establishment opposed to Corbyn, fear he is changing the nature of the British political discourse about Israel and the Palestinians. Beyond this, they are worried that should Corbyn, or someone else from his wing of the Labour party, reach power, they will put the Palestinians at the heart of a Labour government’s foreign policy. Much is at stake. A strange, if largely obscured feature of the supposed anti-semitism crisis – set out at length in my first Mondoweiss article – is that so many of those accused and convicted in Labour of this hate crime are Jews. The latest person accused by the party of antisemitism – and this week expelled – is Moshé Machover, a mathematician and philosophy professor at the University of London. He was born and raised in Israel. Machover appears to be among the first Labour members to be netted by a rule change on antisemitism introduced at the party conference last week. Activists in a new group called Jewish Voice for Labour, launched at the conference, had warned that the change in wording would allow the party bureaucracy to expel members for “thought crimes”. As previously explained, the rule change was pushed hard by a powerful pressure group in Labour called the Jewish Labour Movement (JLM), which is the sister organisation of Israel’s own Labour party. The JLM helped create Labour Friends of Israel, which has traditionally been a key pro-Israel lobbying group among Labour members of parliament. Both organisations have clandestine ties to the Israeli government through Israel’s London embassy, as was revealed earlier this year by an Al Jazeera undercover investigation. It secretly filmed this collusion in action, as pro-Israel Labour activists plotted to subvert Corbyn’s leadership, even at the cost of irreparably damaging the party. In decrying an “anti-semitism plague” in Labour, the JLM and its supporters have claimed that they are not conflating antisemitism with anti-Zionism. But Machover’s case clearly illustrates that they are doing precisely that. Machover received a letter from Labour head office this week alleging that he had breached the party’s anti-semitism rules with an article (PDF), paradoxically titled “Anti-Zionism does not equal anti-Semitism”, in the newsletter of the Labour Party Marxists group. For this reason, observed Machover, quoting Zionist and Nazi leaders of the time, some Zionists welcomed the early policies of the Nazis, including even the notorious Nuremberg Laws of 1935. This was before the Nazis switched to a policy of extermination in the death camps. Both anti-semites and Zionists wanted Jews and non-Jews separated, and both rejected miscegenation. A similar argument, expressed more clumsily, led to the suspension of Ken Livingstone, a former London mayor, earlier this year. It is notable that the Labour party accused Machover of antisemitism on the grounds that his article was likely to “cause offence to Jewish people”. It begged the question: which Jewish people? That issue had, in fact, become a battleground at the conference. Jewish Labour party activists had set up a new group, Jewish Voice for Labour, to act as a countervailing force against the traditional dominance of the JLM in influencing the party’s policies towards Israel and the Palestinians and against its accusations of antisemitism by Corbyn supporters. Jewish Voice for Labour represents a broad range of Jews who have until now been marginalised in the Labour party, including trenchant critics of the occupation, anti-Zionists and supporters of BDS, the boycott movement. For the first time they have a collective voice within the party. The letter from Labour head office also accused Machover of violating the definition of antisemitism produced last year by the International Holocaust Remembrance Alliance (IHRA), an inter-governmental body. The definition has been adopted by the Labour party, as well as by the British government. As Stephen Sedley, a Jewish former British appeal court judge, has noted, this raises many problems. If anti-semitism is defined as a “perception”, who is qualified to do the perceiving? And if antisemitism “may be expressed as hatred”, does that not also imply, more troublingly, that it “may not be” so expressed. * Manifestations might include the targeting of the state of Israel, conceived as a Jewish collectivity. However, criticism of Israel similar to that levelled against any other country cannot be regarded as antisemitic. * Applying double standards by requiring of [the state of Israel] a behaviour not expected or demanded of any other democratic nation. * Denying the Jewish people their right to self-determination, e.g. by claiming that the existence of a state of Israel is a racist endeavour. * Any discourse that takes as its premise that Israel is not a liberal democracy, but rather a Jewish state, as it declares itself to be, or that it practises apartheid, or that it should be subject to a boycott, appears to fall foul of this definition. Under pressure from the JLM, the National Executive Committee, Labour’s ruling body, and last week’s conference accepted a compromise amendment to the membership rule book. An existing clause protecting freedom of thought and speech was dropped. From now on, members can be expelled if their behaviour “might reasonably be seen to demonstrate hostility or prejudice”. The JLM, however, had tried to foist on the party a more draconian definition: that an anti-semitic incident should be “defined as something where the victim or anyone else thinks it was motivated by hostility or prejudice”. Noticeably, the letter from Labour head office to Machover echoed this rejected definition. It objected to the use of “language that may be perceived as provocative, insensitive or offensive”. This process of redefining anti-semitism by the Labour party is not happening in a vacuum. Politicians and media pundits are starting to push the debate about anti-semitism in disturbing new directions more generally – and this process has accelerated since Corbyn became leader. This dangerous trend was highlighted in a commentary last week in the midst of the conference. Jonathan Freedland, a senior columnist at the Guardian newspaper and the Jewish Chronicle, is highly influential among Britain’s liberal Zionist community. He is possibly the most prominent arbiter of “anti-semitism” on the British left. He used his Guardian column to attack three well-known Labour figures closely identified with Corbyn who had each dismissed the “Labour’s anti-semitism plague” as mischief-making. Freedland accused former London mayor Ken Livingstone, award-winning film-maker Ken Loach, and trade union leader Len McCluskey of anti-semitism denial and leading Labour into a “dark place”. In a circular proof of Labour’s anti-semitism crisis, Freedland cited calls from some Labour activists – in fact, a handful – to expel the JLM from the party. He avoided mentioning why: that the JLM had been caught redhanded conspiring against the party leader by the Al Jazeera investigation. Freedland also noted that there were “Marxists” at the conference handing out leaflets – presumably a reference to Machover’s article – repeating Livingstone’s point about the documented negotiations between Zionists and Nazis in the early 1930s. Freedland, a former winner of Britain’s Orwell Prize, then indulged in some trademark Orwellian “newspeak”. He argued that the three leading Labour lights were not in a position, as non-Jews, to assess whether there was an anti-semitism crisis in the party. Only Jews could make that call – and, he added, Labour’s Jews were adamant that the party had a big problem. Here Freedland effectively backed the draconian and rejected definition of anti-semitism originally proposed by the JLM at the conference. According to both the JLM and Freedland, anti-semitism cannot be adduced through objective criteria, or by applying traditional definitions, such as hateful statements or actions against Jews because they are Jews. Instead, Freedland and the JLM believe that anti-semitism can be defined far more broadly. It exists, they say, if it is perceived as such by its victims, even if no tangible evidence can be identified. It is like a mood sensed only by those – Jews – who are attuned to it through their firsthand experience of anti-semitism. Disturbing as this definition is, Freedland went further. He posited that Livingstone, Loach and McCluskey were arrogantly dismissing a Jewish consensus on the prevalence of anti-semitism in the party. But there was a deep flaw in his reasoning: the conference had just proved that this consensus did not, in fact, exist. The non-Jewish trio were speaking not only about their own failure to identify examples of anti-semitism in the Labour movement. As prominent figures in the party, they were also giving voice to those Jewish members whose views had long been ignored because they did not accord with those of the party’s Israel lobby, the JLM. Jewish Voice for Labour had been established to provide a counterweight to the JLM and give Jews critical of Israel a collective voice. Here was Freedland not only discounting their voice but failing to notice it even existed. Jews, Freedland implied, only counted when, like the JLM, they wrapped themselves in the Israeli flag. But Livingstone, Loach and McCluskey never posited a Jewish conspiracy. That was a figment of Freedland’s feverish imagination. Unlike him, they fully recognised that a significant section of Jewish opinion in the Labour party felt exactly the same way they did about the misuse of unsubstantiated anti-semitism allegations to discredit Corbyn and deflect attention from his efforts to focus the party’s attention on Palestinian suffering. What this trio and the Jewish Voice for Labour had argued instead was that a small, unrepresentative group inside Labour – a self-declared pressure group – was trying to advance the aims of the Israeli state. This was hardly a radical conclusion. After all, the JLM was doing exactly what it claims to be doing – promoting Israel’s interests – while additionally seeking to conflate those interests with the supposed interests of all Jews and the Labour party. Like all lobbies, the Israel lobby plays the cards it has in its hand to win its case. But unlike other lobbies, the Israel lobby can silence critics with a powerful threat – of tarring them as anti-semites. Sadly, Freedland amply proved a very human truth: people who wield power, however limited, invariably end up using and abusing it to their own benefit. The new definition of anti-semitism that liberal Zionists, and the JLM, wish to foist on British political life is troubling indeed, and draws heavily on the most divisive kind of identity politics. It asserts that Israel and Zionism are at the core of modern Jewish identity. To criticise Israel is, therefore, to attack Jewish identity – to commit a hate crime. To be “offensive”. If that sounds Orwellian in its implications, too bad. To dispute this claim is proof of anti-semitism too. Like the Medieval dunking of witches, you cannot win. On the left, black people are usually allowed to define what’s racism; women can define sexism; Muslims are trusted to define Islamophobia. But when Jews call out something as anti-semitic, leftist non-Jews feel curiously entitled to tell Jews they’re wrong, that they are exaggerating or lying or using it as a decoy tactic – and to then treat them to a long lecture on what anti-Jewish racism really is. The left would call it misogynist ‘mansplaining’ if a man talked that way to a woman. They’d be mortified if they were caught doing that to LGBT people or Muslims. But to Jews, they feel no such restraint. First, it needs pointing out that plenty of British Jews, including experts on the subject like Antony Lerman and Stephen Sedley, also take issue with the definition of anti-semitism employed by pro-Israel Jews, like Freedland and the JLM. They too believe it is being abused and manipulated for political ends. These Jews have struggled to make their voices heard, not necessarily because they lack numbers but because they have not been organised in the way the Israel lobby is in much of Europe and the US. And in turn, that is largely because they lack the support, funding and organisational backing that comes from allying oneself to a powerful benefactor like the Israeli state. There is nothing unique about this. Lobbies revolve around powerful interests, as one can see spectacularly demonstrated in the United States, where unrepresentative gun, medical, financial and military lobbies dominate political life. But in addition, the Israel lobby benefits from the oxygen of publicity offered by the state-corporate media in a way countervailing groups like Jewish Voice for Labour don’t. The corporate media failed to send a single journalist to cover the group’s establishment at the conference, despite the obvious newsworthiness of the event. And Freedland has continued to ignore the intervention by the Jewish Voice for Labour in the anti-semitism debate. To understand this “oversight” requires a lengthy, separate analysis of the role of the western corporate media in supporting related corporate interests like the arms industry, and of the readiness of European political and media elites to submit to the so-called “Washington consensus” – whatever the US state decides are its core interests. Once these issues are factored in, Freedland’s argument becomes entirely self-fulfilling. The definitions we hear from organised Jewish groups conflate anti-semitism with anti-Zionism precisely because they support Israel’s interests and those of its western patrons. But there is an even more profound flaw in Freedland’s thesis. Black people, women and gays are groups whose views should be listened to sensitively and considered seriously by oppressor groups, precisely because the oppressor is still in a position to oppress. It is not that white people’s views of racism are worthless; it is that their position of privilege makes it extremely hard for them to consider fully what it is like to suffer a particular form of racism and discrimination, or what it means to be a victim. The appeal of Israel to Zionist Jews is that they can enjoy at a distance the empowerment provided by Israel. But Freedland and the JLM’s views of anti-semitism do not fit neatly into this model of victim-oppressor. When the JLM ties its Jewish identity to Israel – a state that privileges one ethnic group, Jews, over native Palestinians; that was built on the dispersion and ethnic cleansing of that native people; and continues to oppress them through a brutal military occupation – it precisely subverts the notion of Jew as victim. In fact, it can be argued that this is the very appeal of Israel to Zionist Jews like Freedland and the JLM. They enjoy at a distance the empowerment provided by Israel. This is the excitement, described at length by liberal Israeli professor Yaron Ezrahi in his book Rubber Bullets, of the Jew who is transformed by Israel into a warrior. It is the reason many Zionist Jews are publicly thrilled by the sight of Israeli soldiers, “his and her” weapons casually slung over their shoulders. But in the case of Jews living outside Israel, this self-image of power, the ability to inflict violence, is more complex. Israel offers Freedland and the JLM a strangely privileged status of oppressor by proxy: they demand a collective identification with a nuclear-armed, highly militarised state while still demanding the right to claim personal victimhood. But Zionist Jews, those who identify their Jewishness with Israel, have compromised that right in relation to Israel. They cannot straightforwardly define themselves as victims precisely because they have chosen to implicate themselves in the oppression of Palestinians. Palestinians have almost no visibility in western debates about victimhood. Even acknowledgment of Islamophobia covers only a few of the problems they face in the diaspora – of their possible denial of entry at airports, of the insults and discrimination they face as Arabs and Muslims in western societies. But it does not address their victimhood as Palestinians, their oppression at the hands of Israel, the complicity of powerful states in the west, and the decades of silence and inaction from liberal Zionists and organised Jewish groups like the JLM. When real leftists, Jewish or not, speak in solidarity with Palestinians, and reject Jewish privilege in relation to Israel, it is not evidence of anti-semitism. It is part of their responsibility to lobby on behalf of a highly victimised group. A group that unlike blacks, women and gays has almost no formal status in western debates about oppression. When the Palestinians gain even a little visibility, it is chiefly because of the actions of grassroots activists promoting initiatives like Israel Apartheid Week and the BDS movement. When Freedland and the JLM reject these initiatives as evidence of anti-semitism, they choose to speak in the loud voice of Jewish privilege, not the quieter voice of Jewish victimhood. The real racism problem in the Labour party, and more generally in western societies, is not currently anti-semitism. It is a profound racism against Arabs and Muslims generally and against Palestinians in particular – a legacy of recent western colonialism, and of anti-semitism in a much broader sense that refers to all semitic peoples, not just Jews. It is a racism that defers indefinitely a remedy for the Palestinians whose land was stolen from them by British colonialists who had no right to transfer it to someone else. It is a racism that confers legitimacy on a Jewish state, even as it boasts of its tribalism in marginalising a fifth of its own citizens because they are non-Jews. It is a racism that claims to champion a two-state solution while preferring not to lift a finger to realise it. Further, it is a racism that smears as anti-semites those whose consciences drive them to fight for Palestinian rights. What is changing in the British Labour party is a growing acknowledgment of this among ordinary members, including an ever larger number of Jewish party activists. The consensus that the JLM and Jonathan Freedland helped to manufacture among left and liberal British Jews is slowly evaporating. Social media – and the instant window it provides on the brutality of life under Israeli occupation – is exposing these purveyors of misinformation for what they are, even as they howl “fake news”. Their time is going, and won’t likely return. Nonetheless, these enforcers of liberal Zionist orthodoxy are not going down without a fight. And in the process they will doubtless wreak much damage on the Labour party – and further hollow out what was once the grave charge of anti-semitism. It is strategy of folly by those who may one day need the protection of both as the real anti-semites try to blaze a trail back to power. The 81-year-old retired professor was expelled from Labour outright with no hearing. A renowned Israeli anti-Zionist was expelled from Labour on Tuesday, as the party bureaucracy falsely accused him of antisemitism. He said he would be taking legal advice and was considering whether to appeal the decision. Machover is well known in scholarly and Palestine solidarity circles as an activist and a co-founder of Matzpen, a group of dissident Israeli socialists active in the 1960s and 1970s. He has lived in London since 1968. A spokesperson for Labour leader Jeremy Corbyn said they do not comment on disciplinary cases. But The Electronic Intifada understands the leader’s office is in fact looking into the expulsion. Machover said his article, Anti-Zionism is not anti-semitism, “won a lot of response at conference” and “very positive and widespread agreement.” This put the right of the party on the defensive, and they are now lashing out, he said. The Times report misquoted the bulletin, claiming it “discussed the ‘commonality between Zionists and Nazis’ ” – the article in fact contains no such quote. The report also failed to mention the fact that Machover is an Israeli Jew, and falsely implied that he had quoted the Nazi official approvingly. Machover told The Electronic Intifada that he had quoted “the great monster Heydrich” to discuss the undisputed historical links between a Zionist minority of German Jews in the 1930s and the Nazi Party. “Membership or support for another political party” is grounds for immediate expulsion, the letter states. Speaking to The Electronic Intifada, Machover said he was not a member of either the Communist Party of Great Britain or Labour Party Marxists. The latter group asked to use his article and he agreed. The Weekly Worker is an “open forum” which is very democratic in its publication policy, he said. He has spoken at some of the [new] Communist Party of Great Britain’s meetings. Tony Greenstein and Moshé Machover speak at a meeting on Anti-Zionism and antisemitism organised by the (new, see Note below) CPGB. Machover pointed out that Labour leader Jeremy Corbyn was for 10 years a columnist for the Morning Star, which is closely associated with the Communist Party of Britain – another left-wing group*. Mounting a tenacious but futile attempt to stay in control, the right wing of the party has teamed up with Israel lobby groups such as Labour Friends of Israel and the Jewish Labour Movement to smear supporters of Palestinian rights as anti-Semites. Until now, Labour’s leadership has only endorsed a two-sentence definition of antisemitism, contained in the controversial document, which does not mention Israel. This letter appears to contradict that distinction. 1) New Communist Party (NCP) 1977 which spawned The Leninist and declared its intention of reforging the party on “firm Leninist principles”. 3) the Communist Party of Britain, which has the electoral rights to the name ‘Communist Party’. 4) Democratic Left. It was established in 1991 when the CPGB decided to reform itself into a left-leaning think-tank based on the party’s Manifesto for New Times. Its secretary was Nina Temple, the last general secretary of the CPGB.